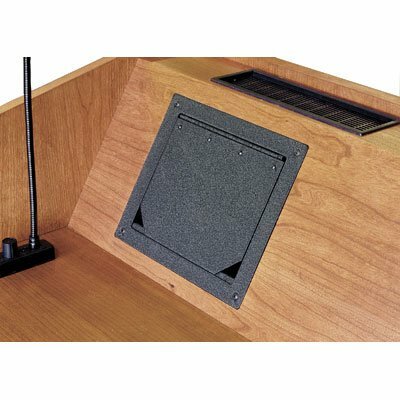 Medium Cable Reservoir with an Extron AAP Super Plate 100, includes Surge Protector. 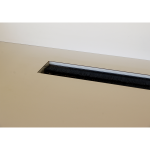 Brush grommets are a more versatile way to bring cables to the work surface, allowing components to be repositioned as desired. Two AC outlets and two USB ports connect to a 6-outlet surge protector with a 6 ft cord. There is one large grommet and three small grommets with cord retainers. Install in the back wall or on the flat work surface. Includes Surge Protector. Our small reservoirs have a large grommet in the bottom of the well. They are usually paired with the AC-USB Outlet. There is a $100 discount on the AC-USB Outlet if you order a small reservoir at the same time. The AC Outlets are wired to a 6-outlet surge protector that is included when you order outlets. 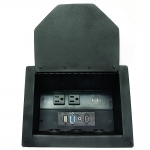 This new Compact Cable Reservoir has two AC outlets in the bottom and two large grommets on either side to allow greater cable capacity in a small space. Includes Surge Protector. AC Outlet with two USB Ports, includes Surge Protector. This AC Outlet has two USB ports as well as two 120v grounded outlets. Our small reservoirs have a large grommet in the bottom of the well. They are usually paired with an AC Outlet wired to a surge protector. They are available in Black, Stainless, and Solid Brass. There is a $110 discount on the AC outlets if you order a small reservoir at the same time. The AC outlets are wired to a 6-outlet surge protector, which is included when you order outlets.